Those of us who are interested in owning firearms and other defensive weapons put up with a lot of abuse at the hand of The State. 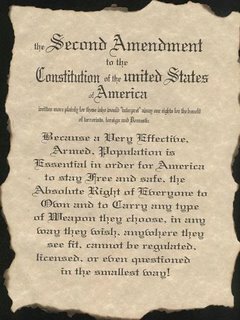 Do you realize that the Second Amendment does not give you the right to "keep and bear arms"? It recognizes a right that is yours simply because you were born a Human Being. No part of the Bill of Rights even applies to you unless you work for government; then it tells you exactly what things you are absolutely prohibited from doing. The rights existed before government; they will exist long after government is in the compost pile of history. Any politician, enforcer, or bureaucrat who violates any part of the Constitution or Bill of Rights (which supersedes the Constitution) has broken the highest governmental law and has illustrated that government is the worst criminal organization, and is subject to justified self-defensive violence. Yet, even if the Constitution permitted gun "laws" they would still be wrong. All gun "laws" are counterfeit "laws". In fact, almost all US laws are counterfeit. Real laws (those in line with Natural Law) do not need to be enforced. Counterfeit "laws" must NOT be enforced. Only an evil person will advocate, pass, or attempt to enforce a counterfeit "law". gov workers who do, invalidating any authority of their position/agency granted by that document. so they act outside the law and outside their oath. but no one holds the individuals responsible for such criminality. and the bureaucracies reward such behavior. without some method to stop abusers, the system invariably runs open loop into hyper-tyranny, and the machinery runs out of control. the flaw is that the system has no method for correction ("negative feedback"), so every correction just pushes faster and faster, making the machine less stable. Watching it tear itself apart is sad. and what pieces can be salvaged, after? Courts were intended as 'negative feedback'; but appointments of activists opposed to constitutional govt turned courts into 'gain amplifiers' for abuses. "All funding originates in the house" was a 'negative feedback loop; until creation of the Fed. and now the house doesn't even pretend to pass budgets- the executive branch just funds by executive order of the king. what 'negative feedback' mechanisms remain? and when the big machine goes into hyper-overdrive and comes apart... you don't wanto be anywhere near it. avoid getting entangled in carnage.